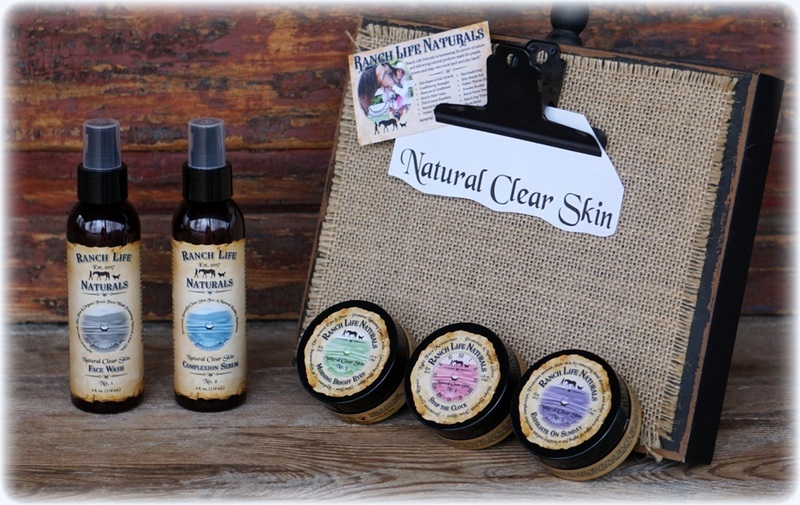 Our Natural Clear Skin Set of all 5 is a natural simple solution to a beautiful clear vibrant face. Taking 4 quick steps daily and one step once a week will leave your skin smooth, clean and fresh with a natural glow that people will notice. The elements of nature take a toll on our skin and our Natural Clear Skin set of 5 is formulated especially for skin that works hard and plays hard. You will feel and see the difference in your complexion. Complexion Serum No. 2– A unique blend of essential oils and extracts with anti-inflammatory, antibacterial, anti-fungal and anti-viral properties that promotes clear skin. A light refreshing serum that promotes beautiful clear skin for a natural healthy radiance. You can feel the difference after one application! Morning Bright Eyes No. 3– is for use around eyes and face. Promotes lightening dark circles, smoothing fine lines, improves skin tone, resilience and promotes cell rejuvenating. Stop The Clock No. 4– is a brilliant light face moisturizer that seems to stop the clock the moment you apply it. When your skin is hydrated it definitely has a more youthful appearance. Our creatively blended formula is packed with heavy hitters to help reduce signs of aging for skin that has seen it all and also keeps youthful skin looking young. Does not clog pores and a little goes a long way! Exfoliate On Sunday No. 5– promotes smooth clear skin by removing dead skin cells and helps reduce signs of aging for a healthy radiant smoother complexion.